By J Hutcherson (Oct 23, 2018) US Soccer Players - Say what you want to about the MLS playoff system, it does draw a line between winners and losers in a way that people running clubs tend to agree on. In, and things are at least alright. Out, and it's a problem. Even a knockout exit provides some cover in a league where there's no such thing as mid-table obscurity. There's also no such thing as alternate titles. It's the MLS Cup that counts more than the Supporters' Shield for obvious reasons. This is a playoff league and all involved know that's the point. What that means in the last week of the regular season is an open question at the top of the Eastern Conference. Regardless of whether or not it's Atlanta or the Red Bulls winning the Supporters' Shield, would a playoff exit at the first hurdle undo their season? Toronto became the first team to turn a Supporters' Shield-winning season into an MLS Cup title since the Galaxy did that version of the double in 2011. It's only happened seven times in MLS history, with four of those happening in the league's early days. Only once has the Supporters' Shield winner lost an MLS Cup final, and that was back in 2003. Three times over the last decade, the Supporters' Shield winners have exited the playoffs in the semifinal round. Back to the question, is that a disappointing season? It's certainly not a great one. 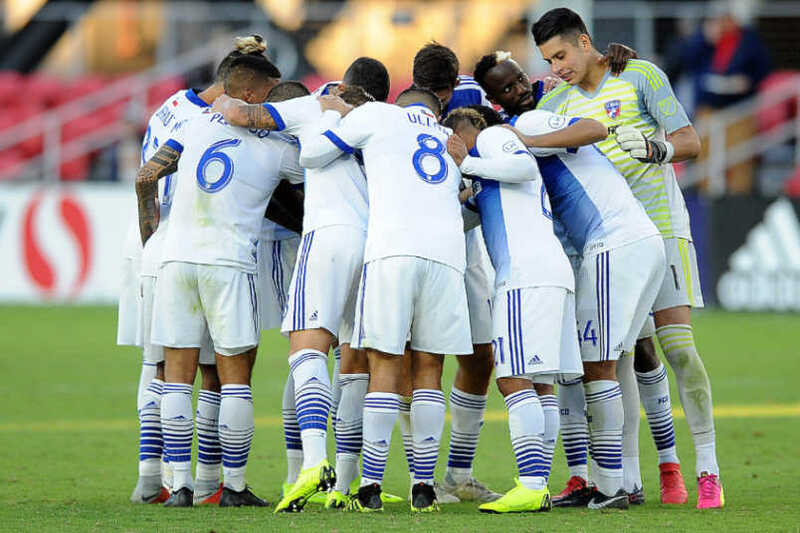 FC Dallas was the last team to win the Shield and quickly exit the playoffs in 2016. They followed that up by missing them entirely in 2017. Though they're still in contention to take the top spot in the Western Conference, the loss to Sporting KC sent two messages. FC Dallas might not be a contender after all and Sporting KC certainly could be. If Dallas walks through the playoffs and ends up the Western Conference representative at MLS Cup, none of this matters. Well, it sort of matters. A big picture problem with MLS is the tendency to under or overvalue the regular season. It's hard to find that median where the weighting is realistic. Clubs fire coaches for almost predictable regular season losing streaks. Winning or losing four games in a row is almost an MLS cliche at this point. It's about navigating that lengthy summer stretch not helped at all by the questionable scheduling and limited rosters. MLS exists in its bubble, asking more of players and coaches than the bigger leagues in Europe. The reward is a mini-tournament that determines success or failure. That's the MLS way, turning the top of the Western Conference into a final day struggle for what would otherwise be a fight for 3rd-place in a single table. It wasn't that long ago when MLS tried for the best of both setups, making all but the conference champions wildcards and watching as one conference took the bulk of the playoff spots. Getting the playoffs right is still very much at issue. Any big change immediately redefines success and failure in this league. It's easy enough to dismiss the playoffs entirely as an unnecessary Americanism. They show up in other leagues around the world, but none of the major ones. It's a way to get to a champion without using the simplest method. The team that wins the most takes the title. In MLS, they take a title, one originally put into play by the supporters groups and adopted by the league. There was no MLS version of the National Hockey League's President's Trophy in the early days. Why would there be? Every topflight soccer league in North America since the 60s used playoffs outdoors and indoors. It was the expectation. Now, it's still a question of expectation. Running through the regular season only to exit early in the playoffs is not the MLS version of success. A team barely getting into the playoffs and ultimately winning the MLS Cup is. Reconciling those two things might be a problem, but that's the way MLS plays the game. Once the playoff bracket becomes official on Sunday, we'll know what success in this league means in 2018. For the teams barely getting in, they've already done enough to look forward to next season. For the contenders, it's time to show that they can turn months of work into a home-and-away series win. Figuring out the playoffs is the job in MLS, and it starts next week.